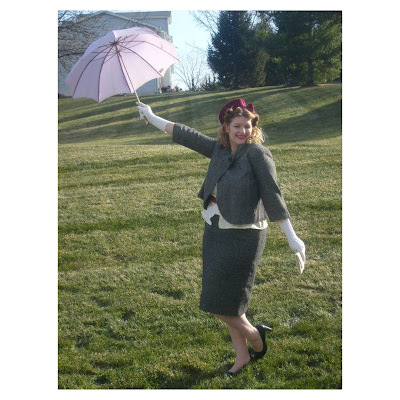 Its been pretty gray and wet outside for the past few days but I don't mind because the rain brings the smell of springtime and its a perfect excuse to break out my favorite accessory, my purple vintage umbrella. I picked up this umbrella while antiquing with my husband about a year and a half ago. I love vintage umbrellas but this one really caught my eye. The lavender color really brightens up a nasty day and I adore the detail on the gold handle. It has a piece of amber in the bottom of the handle. This beaded purse is another one of my favorite things. It belonged to my great great grandmother, Florence Leaver and was passed down to my mom who gave it to me to carry on my wedding day. gorgeous!!! Love your hat, too! You look so glam...I look like crap on rainy days...gonna try something like this! I love it! I live in O'Fallon, IL and I have been to the malls in Alton. Have you tried St. Clair antique mall in Fairview Heights? It's pretty great, but I hear it's more expensive than most. Still, they have nice displays. You look gorgeous, by the way! Love it!